It was my first morning in Siem Reap, on my first ever trip to Cambodia. I knew no-one except a handful of staff I’d met the evening before at the hotel. I couldn’t speak one word of Khmer, and I was still trying to wrap my head around the local currency – I had converted my Aussie dollars into Cambodian riels but was pondering if I should have brought some US dollars instead, as some had advised. You would think having been raised in Southeast Asia and looking more or less like a local, that I would fit effortlessly in; you would be wrong. This was all quite new and quite strange to me. I was in Siem Reap for Wok Around Asia, a food and recipe-focused web series I’m producing for my online platforms. In two days, I would be filming 5 Khmer cooking videos with Chef Chanrith Van of Courtyard by Marriott Siem Reap Resort. I needed to get up to speed quickly on Khmer food, so what better way to do so than to visit the sprawling local market, with Chef Chanrith as my guide? This is both the name of the in-house restaurant at Courtyard by Marriott Siem Reap Resort, and the name of a famous Khmer dish. It literally means “cube”, hence why Chef Chanrith’s version has the beef cut into small cubes, unlike at most other places, where it is sliced. The beef is cooked in an intriguing mix of oyster sauce, kampot peppercorn, dark soya sauce and palm sugar among other ingredients, and it’s so good I ate it again as my last meal before I left Cambodia. By the way, there’s great lok lak per what I found at Lok Lak Restaurant, and there’s lok lak that tastes like a regular stir-fried beef with oyster sauce, at any number of eateries in Siem Reap. Fermented fish; Chef Chanrith explains that Prahok is used in 9 out of 10 Cambodian dishes (click to watch). Cambodians use a variety of flowers in their dishes, as garnishes and in salads. I saw all kinds of pickles at the market, made from what looked like papaya, cucumber and daikon; I’m told they’re commonly served with rice or grilled fish. In one of my upcoming videos, Chef Chanrith uses red ants in a rare beef salad; they taste sour and when deep-fried, they provide a crunchy texture to any dish. I spotted these tubs of what I thought were a chilli paste, but it turns out they were crushed green tamarind. It tasted sour like tamarind, but with a lighter, fresher note. You could be forgiven for thinking these were vegetable offcuts but in fact they’re vegetable premixes used for making soup, which is a staple of Cambodian diet; I’m told that’s what most people eat every day. Cambodians drink palm fruit juice the way we Malaysians drink coconut juice; they also use it to make terrific palm sugar (I brought some back with me to Sydney). Considered the world’s best pepper, they come in a number of varieties – green, black, red or white. I’m still kicking myself for not bringing some back with me to Sydney – long story (though I did find out that the green variety would have been confiscated by Australian customs). 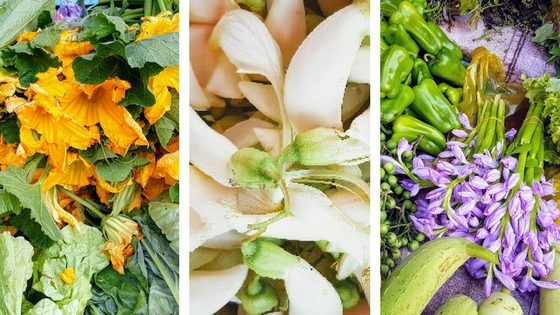 If you’re familiar with Cambodia, let me know your thoughts on what other Khmer foods should be on this list. 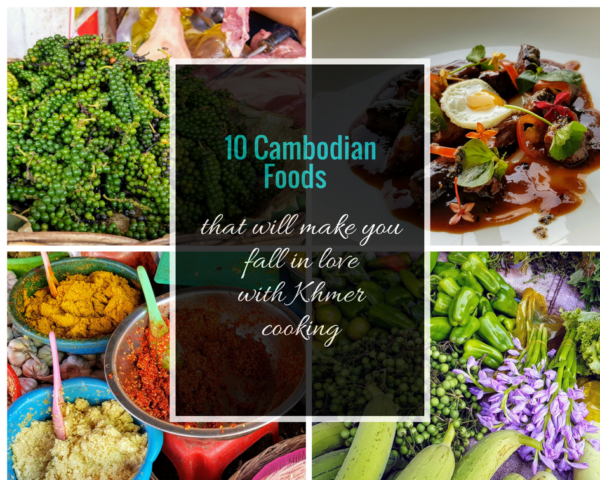 I saw and tasted many fascinating dishes during my stay in Siem Reap, and I came away with the conviction that Khmer cuisine is very much under-recognised in the West. Now that I’m back in Sydney, I plan to explore and experiment with Khmer recipes in my own kitchen, and also to check out some Cambodian restaurants I’ve spotted in Cabramatta. Meanwhile, I also have the 5-part series of Khmer cooking videos with Chef Chanrith Van currently in post-production, so make sure you keep your eyes peeled for them. * Baby Noah and I stayed as guests of Courtyard by Marriott Siem Reap Resort as part of my Wok Around Asia project.